At last year’s E3, EA rushed headfirst into the announcement of a new Mass Effect game with little more to show than concept art and heartfelt promises. This year, the publisher shared an official title—Mass Effect: Andromeda—and a trailer that, while it contains 100 percent more Johnny Cash than last year’s effort, is somehow even less informative. The cinematic clip shows a space adventurer in full Mass Effect regalia swiping through a diverse selection of planetary destinations before settling on a desert locale (befitting their Cash mixtape) and heading into the thick of it. Then it ends. Aside from a projected release window of “Holiday 2016” on PC, PlayStation 4, and Xbox One, there’s not much other information to share. 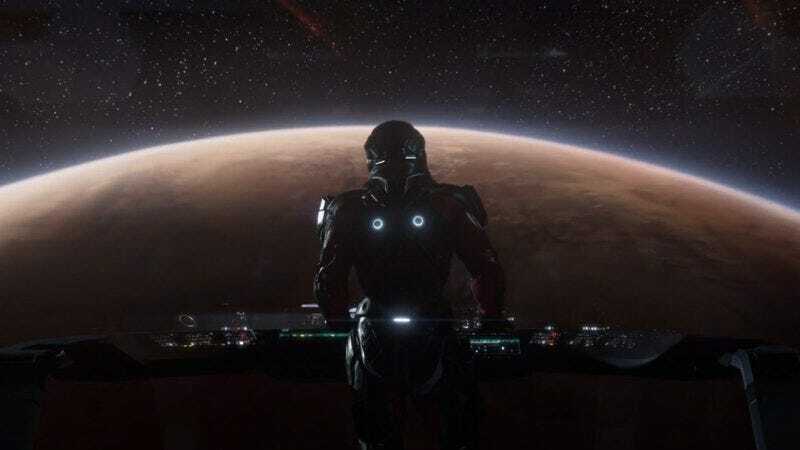 The developers at BioWare have been keen to distance Andromeda from the previous Mass Effects and their star, Commander Shepard. So keen, in fact, that it seems, based on the title and all this talk about “a new galaxy to explore,” they’ve moved the game’s events from The Milky Way all the way to the Andromeda Galaxy. Maybe EA will show up to E3 2016 with more details. Or any details.